Next semester, I'm teaching a course that will feature works by Colson Whitehead and Ta-Nehisi Coates -- two writers whose works I've thought and written about for over a decade now. 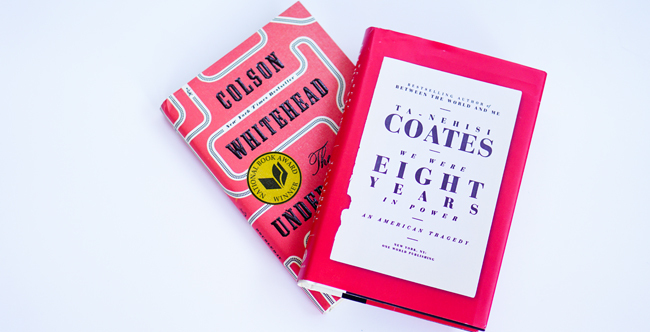 Though their early works were what first caught my attention, my students -- all first-year collegiate black men -- and I will cover Whitehead's Underground Railroad (2016) and Coates's We Were Eight Years in Power (2017). I've covered Whitehead's novels, especially The Intuitionist, in previous years. I taught courses on Coates's works as well. But somehow, I've never assigned books by both writers in the same semester. I'll correct that oversight in spring 2018. I've charted the coverage of Whitehead's novel, and I've started tracing coverage of Coates's newest book. Both writers command considerable attention these days. It's not always been like that, so it's been good to observe them building their audiences and widespread attention over the years. Beyond the attention though, I'm excited about discussing the many ideas that emerge in their works with my students.